How was your weekend? Did you relax or start a new project like I did? This wasn't even on my to do list, but that's usually how things start around here. In.January 2012 while the powder room was getting a makeover I decided to be crazy and painted the sun room, too. Well, four years later the powder room isn't getting anything done again, but I decided on a whim to paint the sun room this weekend. 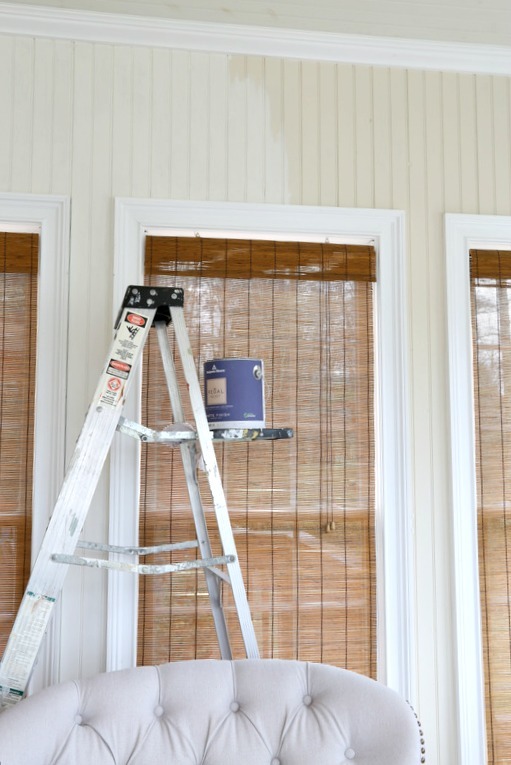 It was at about the same time of month as now that my sun room looked like this as it went from Rosemary Sprig to White Sand both by Benjamin Moore. At that time I thought the White Sand was so light. It was after the walls had been dark for so long anything looked brighter to me. This weekend I had the same mess going on again. 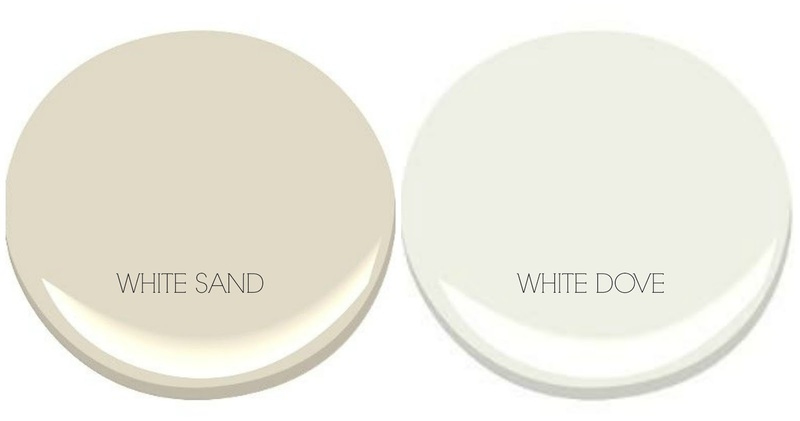 I'm painting the room in White Dove. The new color is so much lighter and I am loving it. You can see the difference in the photo. Now the old color looks dirty compared to the new. I had not even planned on painting this room again and I'm not real sure why except for maybe the fact that we have had more cloudy days in the last several months than sunny and I just needed this room brighter than it was. It was even cloudy while I was working in here and the new color is like a breath of fresh air. Eight years ago we brought a little fur ball home and after she learned how to jump up on the sofa she also learned to chew on the trim around the window. She was like a dang beaver! When we built the sun room we used the trim that is made out of compressed paper to save money. It looks just like wood so no one knows the difference. She chewed our wooden window sills, too. Bad dog! Look at little miss innocence sitting there now. Eight years later I finally have gotten Mr. Savvy to repair the trim while I'm freshening up the room. He first tried to repair it with Bondo, but that was a fail so off to Home Depot he went and bought new trim. Yay! He popped off the old trim, there are two windows she did this to, and replaced it with new. The stucco wall is so hard to paint because of the gazillion holes in the rough surface so I saved it for last. I basically had to pounce the paint on to get in all those holes. And sometimes he even pitches in because he was bored. I think the hand on the hip may help. Here are the colors side by side so you can really see the difference. I'm looking forward to wrapping this makeover up! Follow me on INSTAGRAM for behind the scenes. Love the new color...and did not know that Miss Bailey was part Beaver! That little stinker Miss Bailey. My pups chewed on table legs when they were teething. I love the new color! My living room is painted in Linen Sand by Benjamin Moore and it takes on a pale yellow tone that I'm tired of. I love white dove! Can't wait to see the reveal. I loved the White Sand, but loving the White Dove even more....more inspiration!!!! BM White Dove is the color that we have in both homes. I love the light color and at night you can see that it has an ever so subtle grey tone. Looking good! I love the new color too! I love the new color! I love anything white as you know! I like to do inside home reno's in the Winter too. It's a slow time of year and nice to be inside getting things done. My pupsters never chewed wood. Or shoes. I'm lucky that way. I find I am yearning for and painting in lighter colors. The paint in my apartment seemed white until I went for REALLY white, and now it feels like the sun embraces it more. Love it!! I actually am thinking about using the White Dove to paint our dining room table! I am setting up a painting frenzy weekend, I bought paint to paint our guest room last summer but we had so much company coming and going that I never got around to it, then last week I was looking at another blog, I know I am a blog cheater LOL, and saw a sweet little end table painted Robins Egg Blue, so off to the paint store I went I mean I only had to buy a sample portion of the paint the table is so small, only costing $1.99, LOVE ACE Hardware... and now you show me this beautiful White Dove..... I am off to the paint store again today.....lol. Your projects always inspire me. Have a blessed day..... greetings from RAINY, thank you Lord, French Gulch California, Curtis & Sherrie. It looks great! I changed out living room from Powell Buff to White Dove last year and love it so much that I'm thinking about painting more rooms that color. Thanks for showing us the progress. You are too funny Kim. I could not tell a difference till you showed them side by side painting the new color on. I keep thinking I am going to repaint our kitchen to a color with less of a yellow tint to it. It does look so fresh in there! Your husband is such a trooper! Yep I like the brighter white no that yellow undertone. Good choice. That's a great color. I'm looking for a white to do my kitchen area over with. My husband is a much better painter than I so I rely on his help! I put White Chocolate in the office but there is a hint of green in it that I would prefer not to have. I'll get a sample of this to see how it looks. I had a cocker spaniel that did some wood re-work at my mother's home. She didn't get as far as yours and it was stained so we were able to fix it. I'm sure replacing your trim was the best for the long haul. I would find myself out in this room the most if it were mine. Such a cozy room with great atmosphere! Let there be light! So bright and beautiful. More, please!! Miss Innocence - yup, I have one of those! I like the slightly whiter color. It's funny how just a slight change in the color tint makes a big difference! The new color is very nice. I got a laugh at your husband with his hand on his hip. That is exactly what I do except opposite hip/hand. Love the new, fresh white! It reminds me of the old song, "Let the Sunshine in, Let the Sunshine in" by the 5th Dimension! Thanks a lot. The last thing I need is another blog to obsessively check. Why did you have to make everything so lovely and interesting!?! Looks great, Kim. I love it. Looks great! I have a dog that's part goat - she chews the corners of my throw pillows and literally hops in the yard on all fours - lol! Your room refresh looks great. How long to work on the powder room?! I don't feel so bad for taking 3 years to do our master bathroom. "We're still gathering our pieces to create a great re-do" Yeah I didn't even remember we bought the vanity till I showed my hunny bunny one I wanted to buy. He showed me the box in the garage. Of course there was a huge pile "stuff" on top of it. Oh well. It's a new year. Crossing my fingers . Barbara Ann, the powder room was finished in 2012 and I painted it again last year. It only took us a weekend to do the makeover and the sun room is finished, too. It doesn't take us long because I don't stop until it's done. I can't stand the mess to linger. It's a great change, Kim. It's amazing how a simple color change can really make a room feel more modern and fresh. I am on a quest to lighten up my entire house. I'll be happy if I actually do one room! Hi Kim, the new paint color looks great! We have stucco walls too, and it's definitely a pain in the neck to paint. It is beautiful. You will love living with white. Sometimes we just need to rest a bit and white is just the ticket. It's looking great Kim! I've used White Dove all through my house and on the kitchen cabinets and I love it. Kim, the newer white looks fabulous. But what color did you use on all the trim? Hmmmm... Luv the brighter white Kim. so cute...but so bad. Room looks amazing already. I need to paint...but I'm putting it off. Maybe if I envision myself painting with my hand on my hip I'll be inspired???? :) Mr. Savvy is a good man. And your fur baby is precious even though she was naughty! Lovely color choice and so fresh for the new year, Kim! It looks beautiful Kim. After doing all white upstairs when we installed the dark flooring, I am such a fan! This is my fav room of yours, it's just so inviting!! It looks so light and fresh Kim! I love White Dove, such a great creamy white isn't it? I'm one of those who takes awhile to adapt to and fall in love with the new trends. I couldn't be more pleased about the come back of the white kitchen. White kitchens, white painted furniture, white slipcovered sofas...love Love LOVE! But, I haven't caught on to white walls yet. An image of your sunroom found online is what led me to your blog a few years ago. I may stand alone in this...but I'm kinda partial to your former Rosemary Sprig walls. Still it's been so fun to watch my favorite room in your home evolve. Keep on inspiring! Love the lighter and brighter color! I like the new light colur a lot!